Every modern Airstream is pretty well set up for living off the grid, for a day or two. But if you want to get away from crowded campgrounds and park somewhere without hookups for more than a weekend—in other words, boondocking—you’ll want to start upgrading your Airstream and your camping practices a bit. The best and least-expensive way to extend your boondocking time is to learn how to conserve. Learn the “navy shower” technique, do less dishwashing or learn to wash very efficiently or use paper plates, replace all lights with LEDs (if they aren’t already), set the furnace temperature lower and sleep with an extra blanket or dog, etc. Conservation takes a little effort and a little practice, but it pays off immediately. When using the 12 volt batteries you won’t be able to run the air conditioner or microwave, so the remaining big energy consumers are the furnace, water pump, and laptops. Airstream batteries are typically sized with just enough capacity for an overnight or a weekend (if you aren’t running the furnace a lot) because most people don’t use the trailer away from shore power for longer than a night or two. Once the batteries run out of juice, everything in the trailer goes off: refrigerator (even when running on propane), heat, light, water pressure … even the hitch jack won’t go up or down anymore. So power conservation is important. To reduce the drain caused by laptops, try using a tablet or your phone instead. An iPad requires about 10-20% of the power of a laptop and can charge quickly from a cigarette lighter plug, instead of requiring an inefficient inverter. (You can pick up USB cigarette lighter adapters easily if you have an older trailer without USB outlets.) Shorter showers and limited dish washing will also cut power consumption by the water pump. Carrying a portable solar panel can be very helpful if you like to camp where trees shade the Airstream. 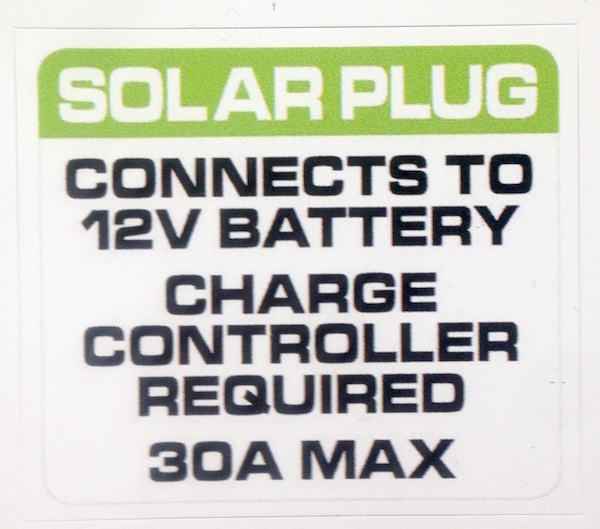 With a solar panel kit and an extension cable you can put the panels in a spot where the sun hits them. Solar isn’t a perfect solution, but it’s silent, free to operate, eco-friendly, and you don’t have to carry gas. With summertime sun, a pair of solar panels can extend your boondocking time by days. If you find the two batteries supplied with the Airstream aren’t enough, consider going to larger batteries. This will require some custom work, but you’ll get a lot of value out of it. In hot weather, try to spend the day out of the Airstream. This cuts down the length of time you’ll need the vent fans. Each vent fan consumes about 2 DC amps, which means three of them running for six hours = 36 amp-hours. That’s a lot of juice, which is put to better use after sunset when the temperatures start to drop. In the winter, furnace use is the problem. The furnace eats a lot of power (7-10 amps when running) and it’s fairly wasteful of propane too. A catalytic heater is helpful, since it doesn’t use electricity at all, and is much more efficient at turning propane into heat. Propane isn’t much of a limitation in the summertime, since a pair of 30-lb. tanks will run the refrigerator and water heater for weeks. 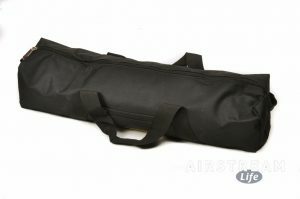 But in late fall and winter you’ll want to travel with both propane cylinders as full as possible. You can easily find yourself spending an unexpected night along the road with only your propane supply to keep you warm. With freezing nights a tank of propane can be used up in just a few days. If you are going to be off grid for a while, get a portable tank to carry fresh water. Serious boondockers will find a place in town or nearby to refill their jerry can or water bottles, and bring a little fresh water back to camp after every excursion. Mark the tank “FRESH WATER ONLY”. After a few days of boondocking it’s nice to hit a full hookup campground for a night just to get everything back in ship-shape. 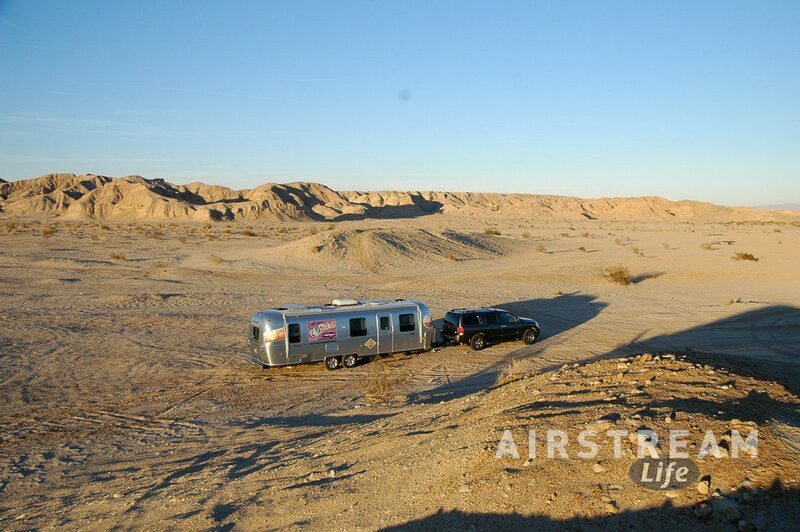 The Airstream will inevitably be full of dirt and gravel tracked in from the campsite, and you might be a bit less fresh than you’d like to be (due to careful conservation of water). Plus there may be various electronic devices that you postponed charging, or the laundry basket might be full, and it will probably be time to get some groceries and dump the tanks if there wasn’t a place to do it before. We find that having a “recovery” day in a full hookup campground is something we enjoy, with long showers and a chance to get everything ship-shape before heading out for more adventure (or home). Lots of new Airstream owners want to find ways to extend their camping time while “boondocking,” (off-grid camping, away from electrical hookups). So inevitably the question comes up: which is better, a generator or solar panels? The answer comes down to your needs. Generators are the most practical way to have enough power to run very high-wattage appliances like the air conditioner and microwave oven. If you must have air conditioning when not plugged in, you will have to use a generator, and it will need to be capable of at least 2,600 watts peak output, and preferably 3,000 watts. However, if you can live without your air conditioner and microwave oven, solar panels become a very attractive option. Solar panels are silent, don’t require you to carry fuel, and are virtually maintenance free (other than washing them once in a while). They work without any intervention from you and can keep the batteries in your Airstream charged while it’s in storage. A major difference is that solar panels only provide power to charge the batteries. They don’t directly power anything, although the batteries will of course power all of your 12-volt devices and can even power low-wattage 120-volt AC appliances like laptops and TVs using an inverter. Most RV generators have on-board inverters so that they can provide 120-volt AC power directly to the Airstream, just like plugging in. This is convenient but most of the time the generator is producing far more power than you actually need. If you want a generator primarily to recharge your batteries while camping off-grid, you can get the smallest generator possible. Even a small 1000-watt (rated) generator can typically produce far more power than the batteries will accept at any given time. The rest of the power is wasted, unless you are running the microwave or some other power-hungry AC appliance while the generator is running. This means that the best time to use the generator is when power demand is high. It’s much easier to avoid using battery power by being plugged into the generator, than to try to recharge battery power later. Use the generator in the morning and evening when you are cooking and using lights and water pump, and the power needed will be supplied by the generator rather than coming from the batteries. If you want to get a generator, do yourself and your neighbors a favor and get one of the quieter models specifically made for RV use. Both Yamaha and Honda make excellent products which have good reputations for reliability and quietness. If you borrow a “construction” generator from work on your weekend camping trip you will save some money but you won’t be popular when you fire it up—and the noise might detract from the peacefulness of your boondocking site, so what’s the point? Similarly, there are cheaper “knock off” brand generators on the market, but their quality is not up to the standards of the major brands. Solar’s big advantage is in recharging batteries, so if extending your time at camp is your primary goal, they are the preferred option. Rather than pumping out large amounts of power in short time periods like a generator, solar provides a steady all-day charge will have a much better chance of getting your batteries up to 100%. It’s like the turtle and the hare. With batteries, slow and steady wins the race. If you have both a generator and solar panels, use the generator when the batteries are heavily discharged (for an hour or so in the morning, for example) to get the bulk charge done quickly, and then let solar finish the job over the course of the day. 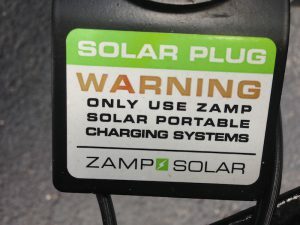 If you only have solar, keep in mind that during the morning and mid-day, moderately or heavily discharged batteries will probably accept every amp the panels can generate. Then the charging rate naturally slows down. If the sun is still shining at that point you have surplus power, and so that’s the time of day to plug in all of your rechargeable accessories like phones, cameras, laptops, etc. This strategy takes maximum advantage of the power being generated. Sometimes people go with generators over solar because they are afraid they won’t have power on a cloudy day. Certainly clouds will drastically reduce the amount of power generated, but you’ll still get some. The solution is to add batteries so that the Airstream has enough power to bridge a cloudy day (or two) without a problem. 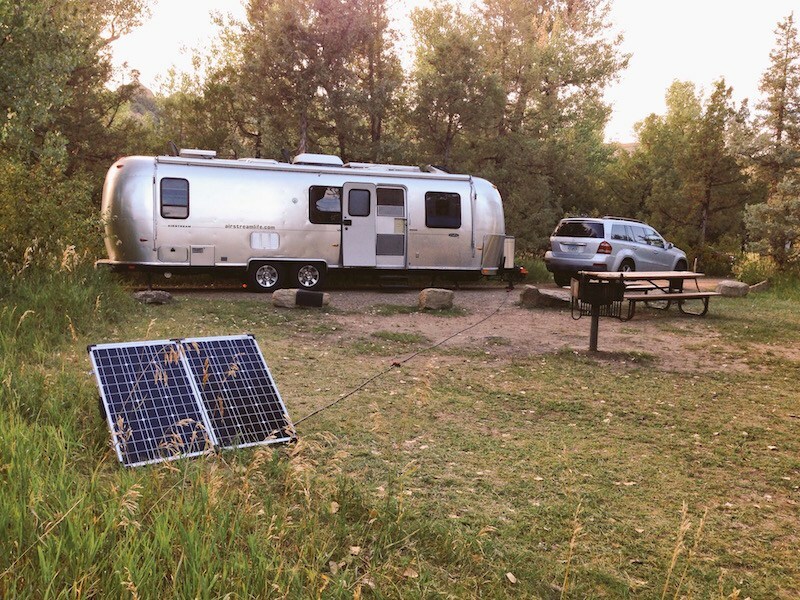 If you are considering adding solar panels, keep in mind that the solar panels should be sized to approximately match the capacity of the batteries in the Airstream. If the panels produce a lot more power in a typical day than the batteries can store, you’ll have wasted money on expensive panels. 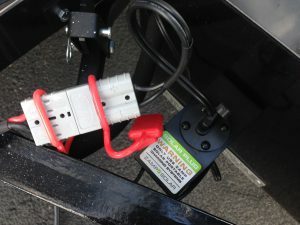 If the panels are too small, they might not produce enough power to keep the batteries charged, which can lead to short battery life if the trailer is not plugged in regularly (such as during long-term storage). It’s hard to do an apples-to-apples comparison of generators and solar panels, because as you can see, they perform very differently. It’s even hard to pin down a cost for comparison, because the output of each option can vary widely. Quiet RV generators from Honda and Yamaha range from 1,000 watt units suitable for battery re-charging and small appliances, up to big 3,000 watt units to run the air conditioner. Solar panel systems (including battery banks) can run from 50 watts up (typically 200-400 watts will fit on the roof, plus more possible using portable panels), and the costs of an installed system are likewise varied. Keep in mind that comparing wattages is not useful since the solar panel runs whenever the sun shines, and the generator usually only runs for short times. You’ll need to decide which option you prefer, and then talk to a solar installer, or shop generator prices. RV solar specialists are in many parts of the country (some are even mobile and will come to you) and they can help determine the optimal size of your battery bank and provide solar panels to match. Either way, upgrading your Airstream to give you more boondocking time is a great advantage. It will open up new travel options for you and eliminate worries about running out of power when on a long trip or during storage. For more, pick up your copy of Rich Luhr’s books, “The Newbies Guide To Airstreaming” and “Airstream Life’s (Nearly) Complete Guide To Airstream Maintenance” at the Airstream Life store.